The stories about the beautiful lake city of Udaipur revolves around the majestic palaces around the Pichola Lake and the royalty of Udaipur e.g. the grandiose Jag Mandir which served as the place of refuge to Prince Khurram (later the Emperor Shah Jahan who built the Taj Mahal), the strongly fortified City Palace and of course the island palace of Jag Niwas (now the Taj hotel). 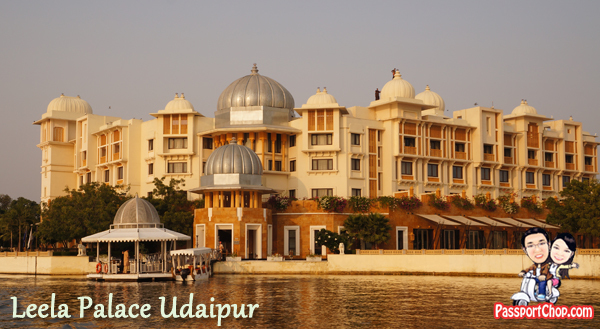 Thus, to complete the experience of living like a royalty in Udaipur, a stay in one of these palaces such as the Leela Palace Udaipur is a must-try but note that such an experience doesn’t come cheap! 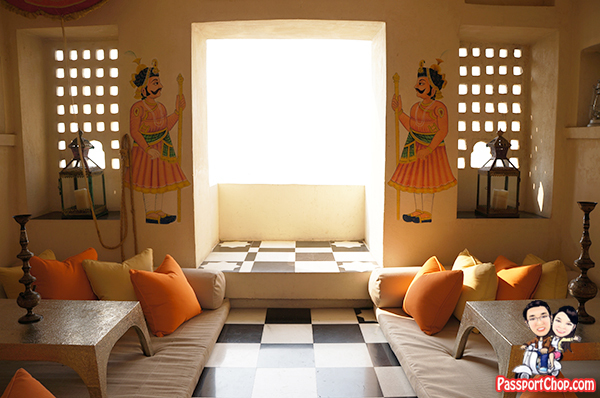 The whole royalty experience of the Leela Palace Udaipur begins as soon as you step out of the Udaipur airport. 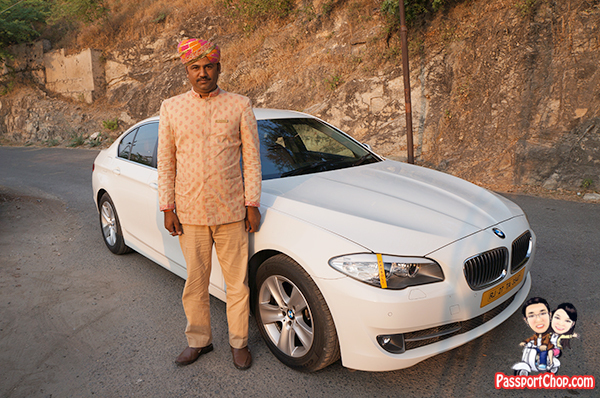 As guests of the Leela Palace Udaipur, you will be ushered to one of the comfortable BMW vehicles on standby where the polite driver will take care of your luggages. 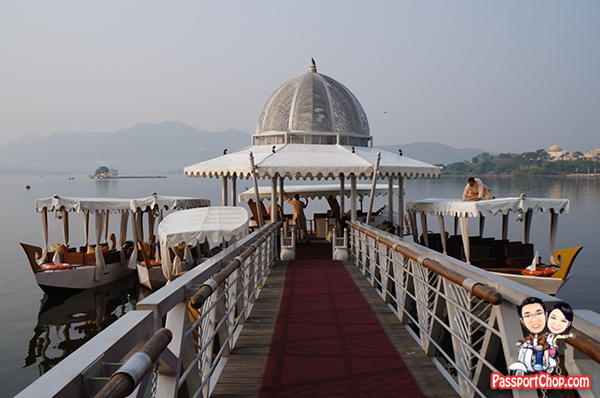 Just sit back, freshen up with a cold towel (provided by the driver) and enjoy the hour long ride to the Leela Palace Udaipur jetty by the Pichola Lake. You can take a quick nap during the drive but if this is your first time in India, I recommend staying awake during the drive and checking out the interesting sights along the streets e.g. free roaming cows, beautifully painted billboards and signboards on the shops. There is a road access to the Leela Palace Udaipur from Udaipur old town but the streets are very narrow – almost impassable for bigger vehicles. Thus, transfers across Pichola Lake by the Leela Palace Udaipur boats are preferred – after all, remember that you are being treated like royalty here so what’s the rush; you also get a scenic view of all the palaces during the short cruise. The Leela Palace Udaipur BMW will drop you off at the jetty (which is just as elaborately decorated to look like a “royal jetty”) where your luggages will be transferred onto the Leela Palace boats. 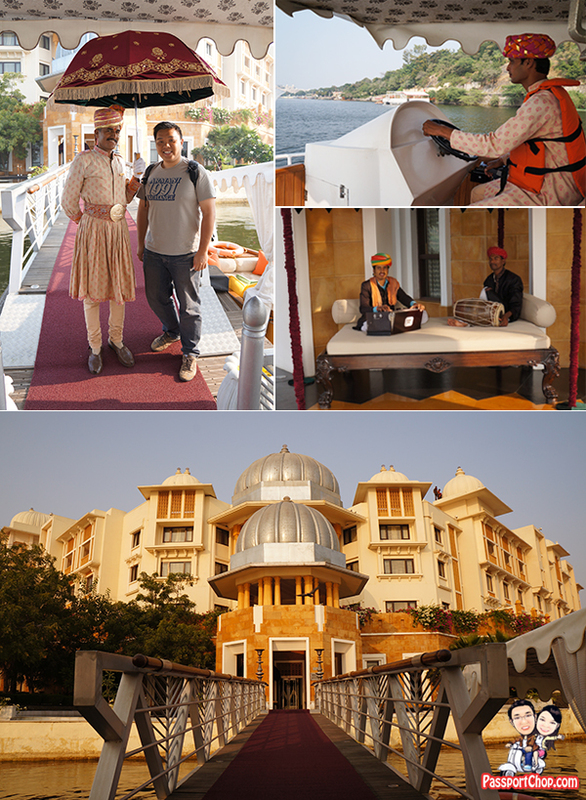 Upon arrival at the Leela Palace Udaipur, the whole royalty stuff begins – the doorman with his giant royalty-looking umbrella to shelter you from the jetty to the door, the welcome music mini-procession etc. – well, I could get used to this! Unlike the Jag Mandir and Jag Niwas Taj Hotel, the Leela Palace Udaipur is not a palace converted into a hotel. While it might not have as rich a history as the other palace hotels around the lake, it more than makes up for it with its rich collection of historial artifacts displayed around the hotel as well as beautiful hotel architecture that makes it look almost like a palace! 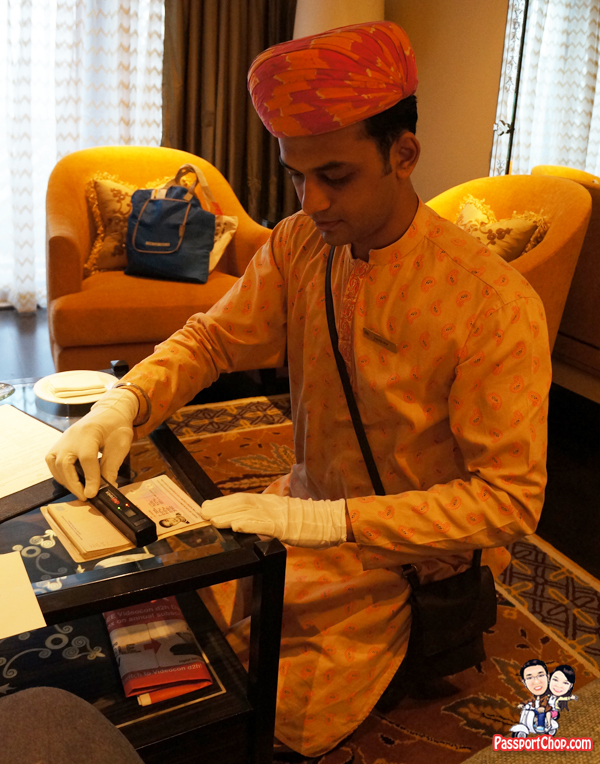 Of course, the friendly and ever helpful staff completes the whole picture of making guests feel very much like a royalty at the Leela Palace Udaipur. From the Leela Palace Udaipur jetty, you will be led directly to your room where your friendly butler will carry out the check-in process while you relax on the sofa in your room with a welcome drink. That is what’s amazing with Leela Palace Udaipur – no guests have to queue to check-in; the check-in process comes to you right in the comfort of your own room. Each room is assigned a butler who will assist with your luggage and try to meet your needs during the stay and of course, check you into the hotel. Our butler is well-equipped with all the forms required for check-in as well as a mobile scanner (there is no need to find a photo-copier to make a copy of your passport – they do it on the spot by scanning it!) and the whole check-in process is done in just 5 minutes! 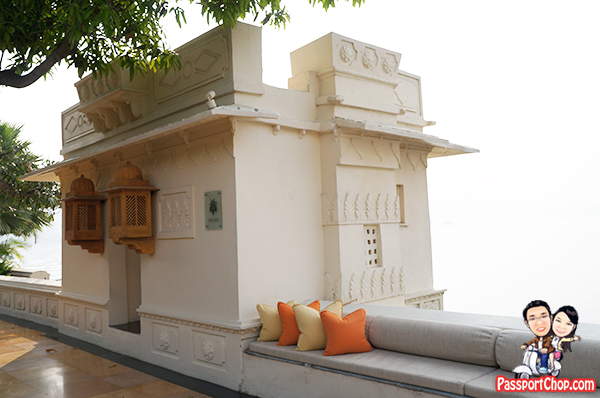 Customised luxury experiences at the Leela are what the Leela Palace Udaipur does best. There are a number of private dining enclaves scattered around the Leela Palace Udaipur complex such as the one shown in the pictures below. The butlers are trained to understand the guests’ needs without being too intrusive with their questions. 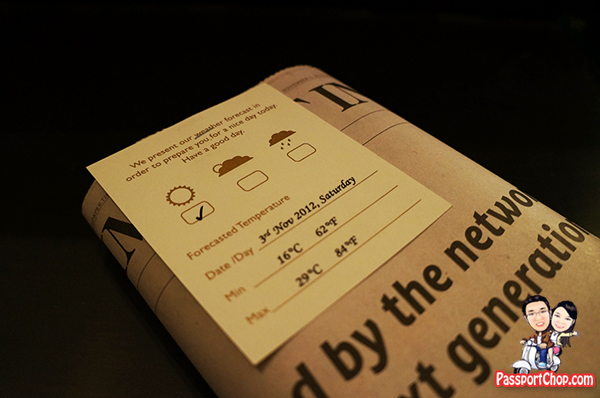 During the short check-in process, they might be able to pick up hints from guests’ behavior e.g. if they are here to celebrate their anniversary or newly-weds on a honeymoon. The butlers are then empowered to make such private dining experiences available to the guests or suggest other customised experiences e.g. tour of the old Udaipur city on the Leela Palace auto-rickshaws (tuk-tuk lookalike vehicles). The picture below shows one of the many private dining enclaves around the Leela Palace Udaipur complex. Guests can enjoy a great view of the City Palace and the Taj Hotel and the serene Pichola Lake from this cozy little hut. Leela Palace Udaipur never ceases to surprise us with their high level of customer service – there is even a daily temperature and weather forecast clipped to the daily newspaper provided to guests. The attention to detail is just amazing! Jet Airways flies to Udaipur from New Delhi twice a day. If you are flying to New Delhi from Singapore in the morning, you will be able to catch the afternoon direct 1-hour long Jet Airways flight to Udaipur.